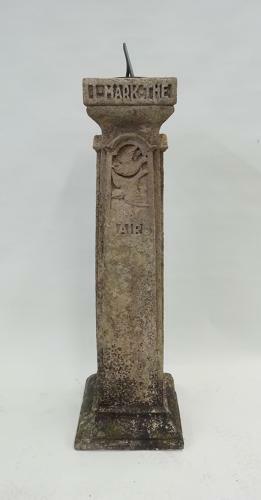 Rare Liberty & Co grey earthenware motto sundial depicting the Four Seasons/Elements; c1900. Nicely weathered! Known as "The Alcuin"; illustrated in their original Garden Pottery catalogue at the time. With its original lovely verdigrised Liberty & Co (stamped) bronzed gnomon. Approx 43.5" overall height; 39.5" excluding gnomon. Base approx 13" square. Top approx 8.5" sqaure.